The triangle below Canal street, best known as TriBeCa, is one of New York City's quintessential neighborhoods. Waterfront access, an abundance of shops, trees, and cobblestone streets make the sedate neighborhood an ideal place to inhabit though rarely recommended when hot spots are requested. Its cool is understated. Serenity being part of its allure, nestled in the lower west section of such a vibrant city, TriBeca is full of hidden gems and local favorites. When we’re looking for a little more than half price drinks for happy hour, Shigure has a menu of discounted small plates including fried chicken and shishito peppers with bonito flakes. Our go-to for a mid-day coffee break, Laughing Man Café is always packed but there’s never a wait. 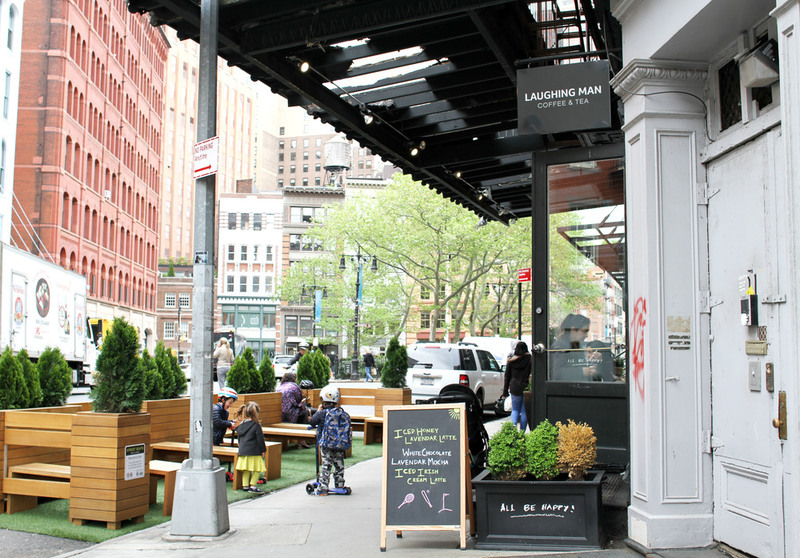 Nestled between Greenwich and Staple on Duane, the spot’s unassuming appearance creates a real community feeling (and we love the outdoor seating). Now that you’re in the know, there’s no excuse to grab coffee anywhere else – all profits go towards the Laughing Man Foundation for helping fair-trade-farmers support their families and achieve their small business dreams. A neighborhood favorite. Diners are hard to come by in downtown Manhattan and Square Diner has all of the American and Greek classics, served in that iconic, fast-paced, clanging plates sort of way. All inside of a vintage train-car. The breakfast sandwich at Grandaisy is one reason to head to work early. An asparagus, onion, and pecorino frittata on bread so fresh it sells out by 9am. If you can’t swing it, stop by before closing for a selection of half priced items. Our flagship and oldest storefront. The root of our brand essence, where Steven earned his reputation for a keen curatorial eye and distinctly urban sensibility. Our model for the downtown cool vibe found in all Steven Alan stores cross-country and worldwide.